Some of the best, of the best Jazz musicians are right under I noses, and we don’t even know it! Curly Martin is one of the best in that category when it comes to Jazz drummers to say the least. Curly is a world class Grammy nominated drummer, he’s studied and has played with national and world renowned artist in all genres of music, with a main focus on Jazz &Blues, along with RnB. A true Omaha native, Curly has been a part of the Omaha Jazz scene for decades, dating back 60 years in the business. Curly was 14 when he started drumming for his first band , Daddy Long Legs and the Rocking Nighthawks. He had a standing gig in downtown Omaha at Mickey’s with a band called Danny and the Roulettes. Curly went on to work with notable figures in the industry, such as Jazz artist Johnny Hammond Smith, Bobby Lyle, and Sonny Smith. Blues artist Buddy Miles, along with R&B artist Willie Hutch, Marvin Gaye, Dee Dee Warwick , and Taka Boom. It’s hard to miss ,Curly’ s most recent collaboration efforts with his son Terrace Martin, on Terrace’s album Velvet Portraits, which received a 2016 Grammy nomination for Best R&B album. Curly’ s future endeavors include an new album that is in the works. Along with an additional project pointed towards youth driven community mentoring within for the creative arts. 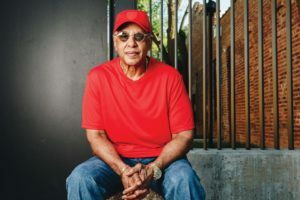 Curly’ s resume of music history is too extensive to list on a single page… the cliché saying that “seeing is believing” comes to mind when speaking on all of Mr. Martins attributes to the Jazz & Blues community in Omaha. Rebuilding the future, and maintaining the sonic essence of what Jazz & Blues truly was, and how its evolving is what Curly’ s mission statement represents to the masses.